The children of Denmark started back at school yesterday. My main man, Felix, started in first grade. It's normal at this time of year that political parties clear their throats and preen themselves after the summer holidays and recommence the battle for headlines. This week has seen a flurry of proposals regarding traffic around schools. 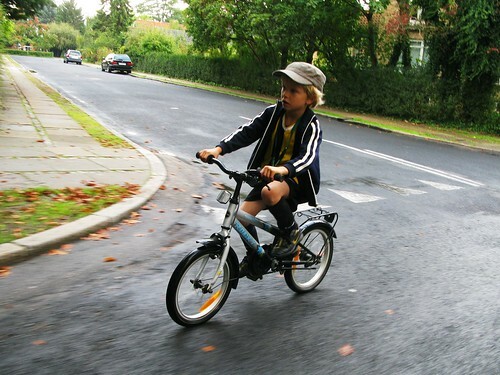 It has never been safer to cycle in Denmark as it is right now but the blossoming Culture of Fear in this country, spurred on by all-manner of scare campaigns, has created a sense of insecurity among parents. Surprisingly, many of the political ideas and comments this week are quite positive and unusually clever. Mainly because the focus FINALLY is shifting towards tackling the problem. Automobile traffic. The Socialist People's Party [SF], the third largest party in the country, have a bold proposal. A so-called 'Safety Package' featuring a series of ideas. In Denmark we have a system where various traffic violations, apart from fines, cost you a clip off your driving licence. If you get three clips off your driving licence, you lose it. - Separated bicycle lanes on all main roads approaching schools. - A car-free zone, where possible, in a radius of roughly 200 metres around all schools. Where this isn't possible, a no-stopping zone around the schools during school hours. Violation of these laws results in a clip off your driving licence. - A 20 km/h zone in a radius of 500 metres around all schools in Denmark. Break the speed limit at you get a clip off your driving licence. It's all so simple. At the moment school zones have a speed limit of 40 km/h. Knocking 20 off of that would be brilliant. Parking 200 metres away from the school and walking the last stretch is hardly time-consuming. As SF's MP Pia Olsen Dyhr says: "When parents start driving their kids to school, it causes the next wave of parents to do the same because it becomes dangerous for children to cycle or walk to school. It's a vicious circle that needs to be broken." Getting support from the other parties in parliament is another story but the proposal is bold and welcome. Conservative MP Henriette Kjær doesn't fancy the idea much and thinks that children should be allowed to be dropped off in a car. Apparently she thinks 200 metres is a loooong way. Social Democrat MP Magnus Heunicke fears the consquences of barriers for car traffic around schools. "It'll make the daily lives of the many Danes who live close to schools chaotic", he says. He must still be on holiday in his brain. If you live CLOSE to schools you don't NEED to drive. Silly rabbit. The Social Democrats want Fart Control around all schools. (Sorry. I couldn't resist. 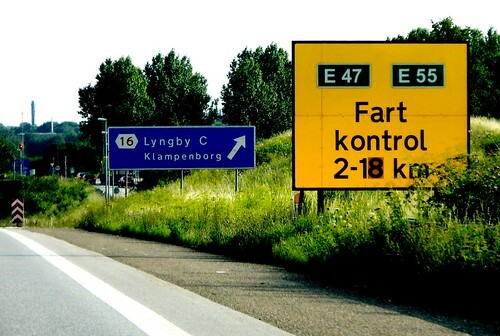 'Fart kontrol' in Danish means 'speed enforcement'). Their proposal to put up speed cameras around schools, in order to force parents to slow down, doesn't look like it'll get much backing in parliament. Ah, so that's why didn't they dissed SF's proposal the day before! They have their own little baby. But it's not realistic. It's a costly solution, paying for installing thousands of speed cameras. The Conservative MP Henriette Kjær also thinks it's an expensive proposal. She thinks that counties and cities should improve bike lane infrastructure to schools instead. Hang on, wasn't that what SF said yesterday? Don't you have ideas of your own, Henriette? Magnus Heunicke from the Social Democrats says that parents driving their kids to school risk running their childrens' friends over. Yes, but he didn't like the lower speed limit and car-free zone proposals yesterday, which is much cheaper to implement than speed cameras. Ah, politicians. Anyway, at the end of the day it's refreshing to see some positive ideas brought to the table. At our school we have trouble finding bike parking but there are many other schools where cars are a problem. Actually, the number of children dropped off at school in cars has increased by 200% since 1990 so there it is a pressing issue. To wrap up, there was a rather sharp headline elsewhere yesterday, this time from the Road Safety Council. "Parents are a threat to schoolchildren." "Parent motorists don't often take care enough when driving to school", says the Road Safety Council. "They just worry about dropping off their own child safely. You don't learn much about traffic sitting on the back seat of a car." Anyway, that's a little round-up of traffic proposals in Denmark. As we've written about before, most kindergartens in Japan don't allow children to be dropped off by car, which encourages cycling.